The Dolphin was completed in 1932 as the seventh boat of the V program and was rather smaller than preceding U.S. submarines. She suffered from many of the same faults as the Cachalot class, but she did have some innovative features in the hull design, including as placing the fuel tanks, which required less maintenance due to the protective effects of the diesel oil, at the ends of the boat. She also had improved M.A.N. engines, with which the Bureau of Engineering was growing in confidence. 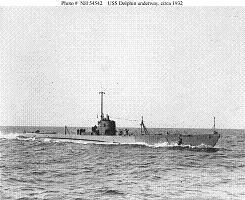 Dolphin was present in Pearl Harbor on 7 December 1941, but made only three war patrols before being assigned to training duty in 1943 and for the remainder of the war.